Currently, Timothy Weddle resides in St. Louis with his fiancée. Aside from practicing, gigging, and traveling, he enjoys designer board games, cooking, lifting weights, and simply relaxing with friends. Elgar’s Enigma Variations. Honestly, I have several “favorites,” but this was memorable because it was my first orchestral experience with all-collegiate orchestra in 2005. After realizing I couldn’t get a degree in electric bass, I decided to continue playing but made the switch to double bass when I went to college. 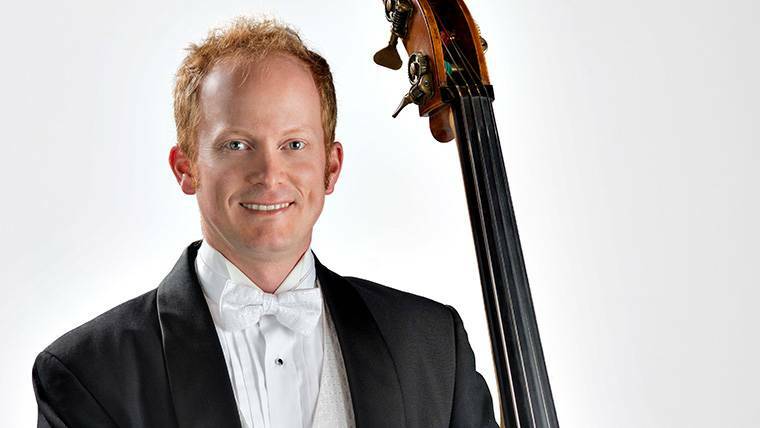 I would have to say I’m inspired by my teacher Erik Harris – principal bass of the Saint Louis Symphony. His command of the instrument and charisma make him a very strong leader; something I strive for. I’ve been told I look like Gary Sinise (excluding the red hair) so maybe he could do the job. However, one of my favorite actors is Micheal Keaton, so I’d prefer him.